Film's equivalent of the great song? When comparing the music and film worlds, and how they might react to digital, build fans, etc., people often talk about the differences - one being that film doesn’t have the equivalent of the single track, the one song. Many musicians have been able to do things like give away a free track to get you to sign up with your email for updates from them, or give away a track to entice you to buy the album, etc. I’ve been thinking about this today and think film does have the equivalent - it’s what Peter Dekom calls “moments” or those things that people see and remember, tell their friends about, laugh about over the virtual water cooler. You know, like when Napoleon Dynamite’s uncle hits him in the face with a steak, your favorite line from Monty Python or perhaps the most infamous - “you lookin’ at me?” moments. These are our equivalent to the great single. This is obvious, of course, and I’m simplifying things a bit, but oddly, I’ve not heard it discussed at all (clue me in to what I missed in the comments). I think the problem for film is that we’ve bastardized our moments, chiefly through trailers. Trailers often include such moments, but they’re mashed up in a hodge podge that actually does disservice to the film (okay, yes, it sells films or Hollywood wouldn’t use them, but watch this to see how bad they are). It would be better to just set those moments free - literally, and hope they go viral (or do more than hope with some strategy, but that’s for another post). I’m amazed that we still don’t have video ringtones - my cell should be able to “ring” to Singin’ In the Rain with a video clip of the performance. Perhaps this would go viral and then some kids would rediscover it and pay to watch it (ok, they’d pirate it...but because they don’t have a credit card). I’d love to be able to share quite a few moments from indie films with my friends, but the trouble is, I can’t easily find them on the filmmaker’s websites unless they are buried in some trailer. I’m not taking the time to tell my friends to forward to timecode of 1:50 for the funny part, or poignant part, because I know they won’t bother. Filmmakers should be releasing these moments online, and early on. Sure, there’s an argument to saving the best ones for the theater (or DVD), but I think most of us can use all the free PR possible. It’s much more likely that these moments will be traded virally than your stupid trailer. If your moments are good enough, people might pay for the film - IF you make that easy for them as well. If you’re lucky, these moments might actually go viral and get seen more often than your film, but that’s not bad either - I’d be happy being the filmmaker with the one moment that hit 3 million views on YouTube - as would my future investors, I imagine. Anyway, just some quick thoughts - a rarity around these parts (meaning my long winded blog). Whatcha think? 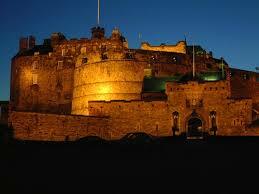 My recent trip to the Edinburgh International Film Festival was grand. As I posted here, I was speaking on several panels for the festival, Shooting People and BAFTA Scotland. I really enjoy these panels, because I almost always learn about new things from the other panelists or we talk about something that really gets my head thinking about new directions in the film/media sphere. This happened once again on the panel called FutureThink, where I was joined by Susan Kemp, Co- Director of Film In the Public Space at the University of Edinburgh, Ted Cawrey of Olswang and the filmmaking team of Stephanie Argy and Alec Boehm who had a film called The Red Machine premiering at the film festival. The panel was about new directions in film and media, and Steph and Alec smartly pushed us to focus more on the future of storytelling than on distribution, etc. The conversation inspired me to launch a new series of columns on this blog, called FutureThink, where I'll pay homage to Edinburgh by trying to write more frequently on emerging trends and how they might impact indie films.My hope is to keep these shorter than my usual (quite lengthy) posts, but that also means I won't be analyzing these things too in depth, just throwing out some ideas in hopes you'll give me more in the comments. Up first, virtual production and/or virtual performance. Stephanie brought this up as an area of great interest to her, and while I had thought about it before, I hadn't really thought about it as much as she has. So, what is it? Well, I think there's many meanings to the term, and all of them are worth thinking about, but here we're speaking about virtual performance - when actors are playing characters through digital renderings, and entire worlds of characters might be produced with green screens, digital tech and some fancy facial muscle techniques - think Avatar, the Hobbit, etc. 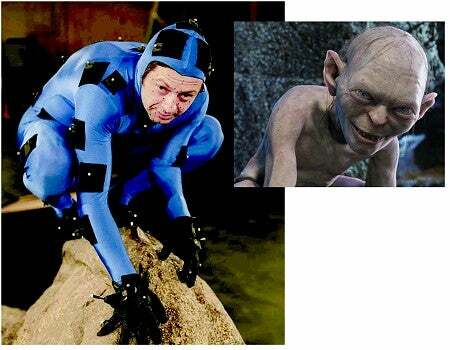 We've all seen these great creations where an actor like Andy Serkis gets transformed into Gollum or King Kong. Stephanie pointed out how different it is for an actor, and for the director, when doing such productions. That's a bit obvious, of course, but I found it cool to think about how this changes the nature of acting. Stephanie likened it to having to go back to all your black-box theater skills. While this is all done through technology, it also kinda gets us back to where the director can focus on working with the actor to create a story world - which perhaps can lead not just to new characters, but also new ways of telling stories. The problem has been (perhaps not a capital P, problem) that such technologies have been and still are very expensive and often proprietary. Like all technology, however, such effects are already getting cheaper and it's not hard to imagine that within a couple of years almost any indie will have the tools on their laptop to create not just amazing CGI but also whatever character they want. This may be with actual actors doing some virtual acting, or it could be completely computer generated. In fact, there's already been many people doing this, creating machinima, or films created in Second Life, where people used their avatars to create an entire Western, for example. That was way back in 2006, by the way, so I'm sure it's come along much further now. As these costs come down, indies will undoubtedly use them to their advantage, but it's interesting that while this phenomenon is nothing new, this was the first panel I've been on where it ever came up in relation to indie and arthouse films. I attend a lot of festivals and conferences, and while I am sure there's been a few (I know SXSW had at least one), I'm surprised it doesn't come up more often. Sure, the technology is a bit in the future, but I'm also worried that many indies are so focused on the current state of things that this sector is bypassing them altogether. None of my indie friends ever mention machinima, yet some of the most interesting films I've seen have been virtual mash-ups, often created by young folks. I meet a ton of actors, but very few who aspire to learn the skills necessary to be the next Andy Serkis. Some theorize that this trend will mean the death of stars, but I doubt it - if anything I imagine a world of fewer stars, but with the same ones playing multiple virtual roles - kinda like how the voice-over world is dominated by just a handful of stars now. I get in plenty of debates about the future of copyright and piracy, but let me tell you - the fights over piracy of celebrity's images will put them all to shame. Once we have fake digital Bogart's running around in every film, Hollywood (every aspect from the stars to the agents to the home office) is gonna sh-t a virtual brick (performed by which actor I wonder?). What does this mean for documentary, when it becomes even harder to be sure that was really so and so big whig talking, not some avatar? Think that there's been a loss of industry jobs due to runaway production and ever-cheapening costs? Just wait until a farmed-out team of teenagers in China or Mexico is being hired via Amazon's Mechanical Turk to produce entire sets and act out most of the motions for pennies on the dollar....I think you get the point, there's a lot of interesting things to discuss, but very few people seem to be having the discussion (if I'm wrong, please point me to some resources in the comments). Of course, it's not all bad - as I said, this might also lead to some cool new storytelling as well. I, for one, am excited at the prospect that much of this work can become cheap and digital, leaving storytellers to focus on story, once again. I'm off to Edinburgh for the Edinburgh Film Fest, which remains one of the better fests out there and which is jam-packed with good panels and activities. I'll be speaking at a few events with the film festival. First, this Sat at 1pm is a panel called "Free for all" and you can guess what that's about - free, piracy, etc. I'm really looking forward to this one, as there's a rep from the MPAA there, and while I am sure he is nice and great, I'm also sure we'll disagree on this issue! I can't find a link online for this one, guess it's too hot a ticket. Then on Sunday, I'll be speaking for Shooting People as part of their Digital Bootcamp. From the website: "For filmmakers, the internet is changing everything. Shooting People presents this half day session designed to help you and your film navigate the rapidly evolving digital and web landscape. The session is aimed at those for whom these tools are somewhat of a mystery, and know they need to understand them. Alongside a presentation from new models in funding and distribution expert Brian Newman, and a thorough case study of The Last rites of Ransom Pride by festival filmmaker Duncan Montgomery, the event is a comprehensive survey of resources, websites, social media, systems, tracking, crowdsourcing, funding, distribution, exhibition, outreach … and more." Monday the 21st has me with Shooting People, BAFTA and the Fest again for Short-Sighted, where I'll lay out more of my thoughts on how to make a living by incorporating free into your business model. There's a lot of other great speakers as well, and I look forward to learning some new things. Immediately after that is FutureThink (Mon 21st) - a discussion on the future of cinema. From the catalogue online: " a look at the future: Where will our industry be in 10-20 years time? The world will always want visual stories but how will we view them and where? Will the rise of digital technology mean that cinemas become obsolete?" I'm pretty sure they won't, but I think there's lots of other changes in store, so it should be a good discussion. Anyway, there's a lot of other great speakers, so if you'll be in Edinburgh check out those links and look me up in town. I mentioned recently at the bottom of a post that I've been posting less frequently because I've been very busy with my "writing time" on editing a chapter that was selected to be part of the new book - 20Under40: Reinventing the Arts and Arts Education for the 21st Century. 20<40, as I'll call it from here on out, is a great project put together by Edward Clapp and you can learn more about the other authors here, and even go ahead and pre-order the book here. My chapter is about "Inventing the future of the arts" and you can see a short summary of my idea in an old post here. Since the time of that post, I consolidated some of the ideas and now have just seven ideas (as opposed to 10) that I will be writing about. I'm in some intense editing now, but should be done soon....if I stop procrastinating by writing other things, like this blog post! Now this might seem like a shameless plug, because it is, but I'm also plugging this because I think it would be a great project to duplicate in the film and media arts world. I once suggested 20 leaders under 40 in the film world, but I'd really love it if some reader volunteered to help put together a similar project for film. Perhaps an open call for ideas, maybe not a book but a film or robust online and video project...who knows, but it would be great to hear some of the good ideas out there, especially those coming from voices we don't often hear (which aren't always under 40...I know). If anyone is interested in taking this idea up, get in touch. In the meantime, check out the 20<40 site for updates on events, the book, other authors and what not. Just back from my old stomping grounds of the ATL, where I did a few private consults and one big, long workshop for filmmakers at PushPush Theater. The experience, for me at least, was great. My slides are embedded after the fold, but first a few words of thought on Atlanta. Having been there, I'm not telling anyone who lives there anything new when I say there's some serious talent in that town. Sure, we all know about Tyler Perry, Rainforest Films, Turner and all that, but the ideas I heard from several producers/directors were pretty incredible. I also like the fact that they have great resources in town like GSU's DAEL center, the Atlanta Film Festival, a top-notch new media/gaming sector and with an amazing tax incentive, there's arguably few places better to shoot right now. They also have innovative thinkers like PushPush Theater. Yes, I am biased as they paid me to consult and to speak, disclaimer enough? That said, I don't know of many other theater companies that are thinking about community and creativity like they are doing. They aren't just a theater company. Sure, lots of people open their doors to improv, to people showing film screenings, to training, to actors who might want to go from stage to screen. PushPush, however, is going further and thinking about how their projects can become multi-platform transmedia productions. This kinda started with a program they did called Dailies, which helped a group of filmmakers workshop a series of short film experimentations into what became Pop Film's The Signal.